We are a supplier of hand-peeled poles and timbers that range in length from 2 feet to 50 feet and in diameter from 2 inches to 36 inches. The quality of our poles is exceptional. They are smooth to the touch and offer a safe and beautiful alternative to machined peeled poles. Our poles are peeled in a number of traditional methods, the more common being the early American practice utilizing the drawknife. This leaves the pole clean to look at and smooth to touch. Another method we use of debarking the tree utilizes the spud to separate the bark from the tree. This allows the true nature of the pole to be expressed, revealing the subtle texturing of knots and grain. These are in turn hand washed to bring out the natural beauty. We also handcraft timbers with an adz and scorp to create rustic beams. Most of the logs peeled and processed at Geronimo Poles are harvested from dry, dead standing Lodgepole Pine found in the higher elevations of the Sierra Mountains. 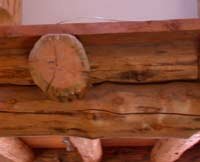 After years of curing in the dry air the timbers become stable and structurally sound. The "checks" you notice in a log are the result of a natural process as the wood releases moisture. Checking occurs across and through the annual growth rings of a log. Checking does not affect the structural integrity of the wood but instead adds character and naturalness.